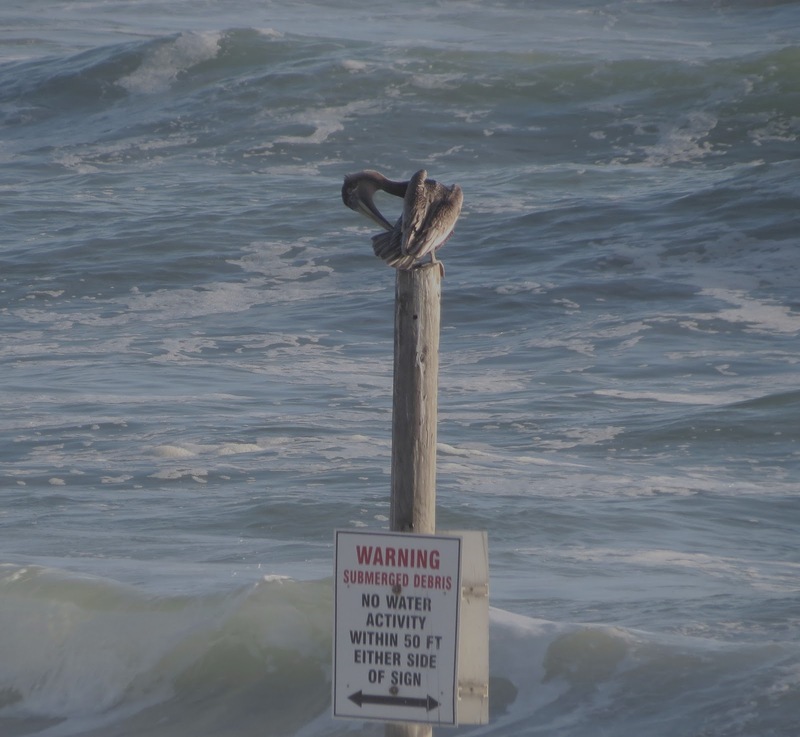 I thought I saw a bird perched on a post in the rough sea at Daytona Beach on Sunday. When I zoomed in, I was amused to find this pelican who seemed to be obeying the sign beneath her. WARNING: NO WATER ACTIVITY WITHIN 50 FEET EITHER SIDE OF POST. The symbolism of the pelican in Animal-Speak is about renewed buoyancy and unselfishness. Despite their size they are very light and buoyant. They can float like a schooner. Often the brown pelican is observed flying solo and then suddenly plummeting into the water. It then pops up to the surface. Symbolically it hints at being able to be buoyant and to rest on top in spite of the heaviness of life circumstances. The lesson the pelican teaches is that no matter how difficult life becomes, no matter how deep you plunge, you can pop to the surface. The pelican holds the knowledge of how to rise above life's trials. Pelicans use their long bill and pouch to scoop up fish and not to store them as depicted in cartoons. The question we need to ask about our own personal activities is: Are you not using or digesting what you have? Are you trying to store what shouldn't be stored? Angel messages come in many different ways. I enjoy a good lesson from nature whenever they appear, it is always timely and on target, presented in a loving manner. I just need to follow through on the nudge. Enjoy your day with the Angels and try to pay attention to those little nudges.